Tips and Tricks on the OCA Java SE 8 Certification Exam! Tips and Tricks for the OCA Java SE 8 Certification Exam! As we plan to certify our people in Java, I started digging for information about OCA Java SE 8 Certification Exam. I was wondering how/where one can take it, what materials are needed for preparation and of course some tips & tricks that one can use while being examined. 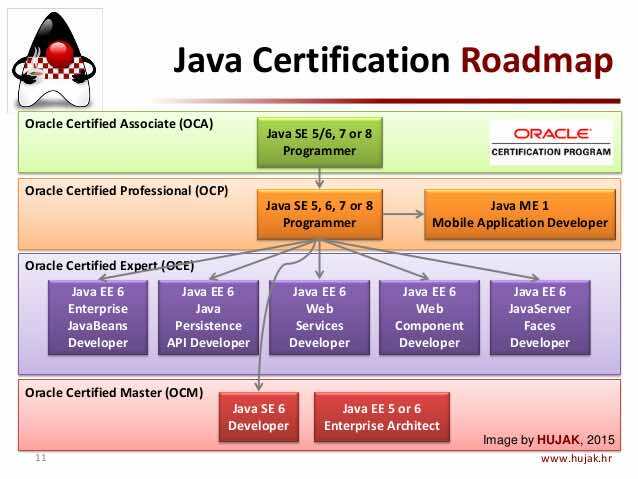 Below is the Java certification path. Luckily, Hristo happened to know a person that just became “Oracle Certified Associate, Java SE 8 Programmer”. I invited him in the office to share some insights. Believing that sharing is caring, I decided to publish Gavrail‘s presentation where you can see some tips and tricks on the OCA Java SE 8 Certification Exam. 6. Quora – What is the best book to prepare for OCAJP Java 8 Exam? The key to success is practice. Go do your homework because you don’t want to waste your time and money. 30 to 40 percent of all people taking the OCA Java SE 8 Certification Exam fail to certify due to lack of practice or nervousness. Be calm. Be prepared. Go at least 30 minutes earlier and you’ll pass it for sure. Hope what’s written above is helpful. Wish you luck and happy certification. Do you know other useful resources? Yes? Please share them with the Java community in the comments below! I just read in one of the websites that we will not be receiving any certificate after passing OCA exam instead we get a certificate only upon completing the OCJP exam. Would really appreciate your inputs on this. Thank for the nice words and the comment. I think this is not true as two of our people recently passed the OCA exam and received certificates. Thank you for the article :), Just wanted to ask how much time do you think is sufficient in order to prepare or is that totally dependent on one’s comfortability with the language? Thank you for the comment. For someone that has 2 or more years of experience are needed at most 3 months. 1,5 months for reading the book on the exam and 1,5 months for making tests. I mean 3 months of spending on average 10 hours per week. I have read whole article all additional resources that are helpful. I have passed my OCA Exam & I got training from Koenig Solutions. Very happy to see that you passed your OCA exam! I accidently found Java SE 8 Programmer braindumps when I met to my friend during my preparation. He suggested me to download this study stuff from RealExamDumps. I am so thankful to him for his suggestion at the right time when I needed for a reliable study material. Oracle 1z0-808 dumps questions changed the way I used to study. It taught me how to study smart. In the event that you are occupied with Oracle yet are not going for this due to its trouble at that point it’s an ideal opportunity to make this stride since 1z0-808 Exam Dumps has changed everything about this exam. Presently you can without much of a stretch pro this confirmation, you simply need assurance. All the data fundamental for exam have been incorporated and rest is dependent upon you. In the event that you work as indicated by the rules, you will pass your exam by the primary endeavor. What’s more, in the event that you need affirmation of your prosperity or fulfillment then you can download demo addresses that will enlighten you concerning the entire material. I was fully fledged for my IT exam attempt after doing preparation from MCSA SQL Server 2012/2014 Practice Exam. It was not an easy job to pass this certification without taking help from this compact study guide. They presented all the information in a very interesting style so I could read it consistently. I am thankful to vceexamstest.com for offering MCSA SQL Server 2012/2014 dumps at this affordable price. I am sure about its helpfulness to so many IT candidates. I recommend this short guide for every IT students with any level of background knowledge of the field.